It has been a few years since she made fruitcake. It is expensive, and it takes a while, and there is all that time sitting, and all that annointing with brandy. Fruitcake is a labor of love. 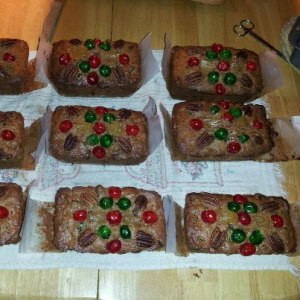 Fruitcake is also much maligned, but still a labor of love. All and all, your friendly neighborhood legume is glad she put in the effort and made them. she was definitely in a “Fruitcake Weather” mood, and it was actually soothing and therapeutic to make them. The ghost of pea’s godmother also must have smiled on the batch, because every one turned out perfect. Not so much as a raisin stuck to the pan. Hopefully, when we get to eat them a month from now they will taste just as good. 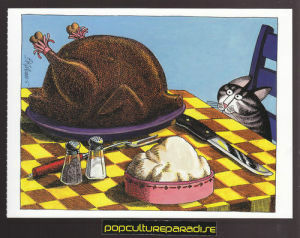 A lot of people wonder at pea’s annual turkey mania. It is a sort of obsession. Come November, there are “turkey wars”. The local grocery store chains fight with each other to have the least expensive turkeys. Usually prices for turkeys go down to about thirty-nine cents a pound. That is pretty damn cheap for meat. Now, this ridiculous price only lasts for about two weeks, and there is a limit of one turkey per visit, and you have to usually spend fifteen to twenty bucks in other stuff to get the turkey at that price. So, by assuring that everything purchased is both on sale, and has a coupon, the initial sales quota can be had for a dollar or two actual money, rather than the fifteen or twenty demanded, plus the final cost of the turkey, each stock-up turkey trip usually costs about ten to twelve dollars. The other trick is to get the BIGGEST effen turkey possible on every trip, to net more usuable meat at the cheapest price. We also have two very large freezers. A five foot upright in the pantry, and a large chest freezer in the cellar. In a good year, we will have ten to twelve turkeys, averaging about twenty three pounds apiece…not counting the bird for Thanksgiving. Now, before all everyone starts to think that we must be sick of eating turkey, virtually none of it is roasted ala thanksgiving. The awesomeness of turkey hoarding is just how versatile raw turkey is. Once thawed, the turkey can be taken apart (Dawn knows all about this) fairly easily. Then the creativity begins. The breast meat can be sliced into thin cutlets, dunked in egg-and-breadcrumb and pan fried….instant “chicken” fingers. And they do NOT taste like turkey. At all. A twenty five pound turkey nets a LOT of fingers, which can be eaten as is…or spread on cookie sheets and frozen, then stored in zip bags for quick dinners. Cover them in marinara…bake til bubbly, cover in cheese…super yum. Make a lemon butter sauce, add capers and you have chicken piccata. Heated in the toaster oven, with Frank’s hot sauce and blue cheese on rolls…chicken finger subs. Cut into larger, chicken breast sized slabs and marinated in various things, they are great grilled as is, or sliced onto various salads, or chopped for chicken salads of all stripes. The tenderloins are great with various sauces roasted, grilled or simmered in the crockpot, and are great for any escalloped dishes. Raw dark meat is even more disguiseable. People having the dark meat dishes have mistaken it for pork, veal, venison and beef. Cut off the bones and into chunks, it makes great stew…just treat it like beef…taters, onions, carrots, celery…seriously yum. Grilled it is even more outstanding. Marinated and threaded onto skewers with peppers and onions and grilled, it rocks…very much like pork. The wings get special treatment. Cut into the “flat” and the “drummie” they get roasted, plain. Then, each kind goes into a zip bag and frozen. At the end of that year’s turkey season, there is a bag of frozen roasted “drums” and frozen roasted “flats”. Thawed, the flats get grilled with bbq sauce…almost just like ribs 🙂 The drummies go into the crock pot with marinara sauce, pepper chunks and onions and make a fabulous “chicken” ciaccatore. Pre-roasting before freezing renders out all the nasty fat from the skin. Then there are all those bones. Stock and soup time. The stock can be frozen, or canned for use anywhere you need broth or flavor. And any sort of soup can be made from the bones…”chicken” noodle, vegetable…and it doesn’t scream turkey flavor once all the veggies and seasonings simmer in. Lastly, all that boiled and semi-flavorless meat from the bones makes a great treat mixed into the cats’ or dog’s food…so nothing goes to waste. It’s Thanksgiving time again, and it is time to gear up the kitchen and get ready for the festive season, and that season starts with making dressing. For something which has a main ingredient of old, hard, dry bread, dressing is pretty wonderful. Except for light fruity nouveau cuisine affairs found in over the top cookbooks, we like all kinds of dressing. We like it with chestnuts and oysters, cornbread, you name it. We like the homogenous bland stuff that can be found at cheap buffet restaurants, and we even like the salty dehydrated vegetable kind that can be purchased in a box, make in a kettle on the stove and “fluff” with a fork. Dressing is, as everyone knows, wonderful with turkey. 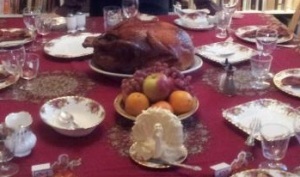 Or as is the case in our family, turkey is wonderful with dressing. We have our priorities straight. Dressing also suits beef, chicken, pork chops…everything really. But, nothing compares with Gramma’s dressing. She concocted it in the forties, sometime during or after World War II, when she had a large family to feed. It wasn’t pretty to look at back then, and it isn’t pretty to look at now. It is a greyish, dense rather stodgy-looking affair. Once sampled however, the inner beauty shines. Gramma’s dressing was never really the same thing twice. She never measured; just tossed her ingredients into a pot and mushed them up. That isn’t to say however, that her dressing wasn’t a consistent classic. Rather it was a complex character, presenting slightly different array of flavors each time it was made. Her dressing came in vintage years, just like wine. In October, she would begin to save bread for Thanksgiving in November. First, she made a series of complex cuts in a paper grocery bag, so that, when opened, a multitude of diamond shaped cut outs remained. She stored her stale bread in this bag. The holes let in air, keeping the bread from molding. One of the reasons for the subtle variations in the finished dressing was the astounding variety of breads she used: Heels and squashed slices of sandwich loaves, homemade bread, old biscuits and hard rolls, egg bread, a slice or two of rye and pumpernickel, a slice of whole wheat here and there, leftover unbuttered toast, even stray hamburger and hot dog buns. These oddments of bread were never enough, so the quantity needed to make up the remainder was always a loaf or two of store-brand white bread—the kind that is so soft it tears when you try to butter it, and sticks to the roof of your mouth when you bite it. All of the bread, regardless of origin was left to become stale in a baking pan which resided in the oven, near the pilot light. When it was perfectly dried out and completely hard, she put it into the paper bag. Of course, whenever you needed to use the oven, you had to put all that bread somewhere. It became not only stale, but well-travelled as it temporarily resided in the dish rack, on the counter, the kitchen table, assorted chairs, the attic stairs, the dining room table, even a bed. But, always it returned eventually to its warm oven. Dressing making day always pervaded by a carnival aspect could not occur too close to Thanksgiving Day itself. The dressing needed to sit. The flavors had to ripen, to meld. We wanted it to be a leftover…which always tasted better…before the dinner even happened. To begin, Gramma would fill a large kettle with cold water. Then she would take the slices of bread, one at a time, soak them and squeeze them out, dropping the soggy bread ball into another, larger kettle. During this process would come the perennial questions and traditional answers, rather like a Thanksgiving Seder, although it wasn’t incumbent upon the youngest there to ask them. Once all the bread is squashed and dumped into the big kettle, the other ingredients, celery, onion, pork sausage and sage were added. There was always a tense family “discussion about the sage’ a debate between the sage lovers and the sage tolerators. Many factors affected the sage. Should we put in two tablespoons of three? Four? You’re crazy. That’s too much. Is the sage rubbed or ground? Rubbed sage is stronger. Not it isn’t. How many years has this been up in the cupboard? Too long, its lost strength. Put in more. No, we did not just by this one it has been there since Last thanksgiving. Stop that. Once you put it in that’s all we’ll taste, and you can’t take it out. Put in more or the dressing will be bland. After such sage discussion and after several attempts to accidentally drop more sage into the kettle were thwarted, it was time to squoosh the dressing… Gramma removed all her rings, washed her hands thoroughly up to the elbows like a surgeon, and plunged them into the mass of soggy bread, raw sausage and seasoning. (ewwwww) Grabbing u a double handful, she squished it through her fingers. Ewwwww the sound it makes during this process is distinctive and indescribable. The dressing would begin to be snitched after the second or third application of gravy, when we were sure the pork sausage component had been thoroughly cooked and was in no danger of causing trichinosis. Such rapture! We would pick out little tastes from the crisping top layer to see how it turned out. But alas, such joys were fleeting. Gramma, a woman of sterner stuff than the rest of us, allowed few samples. She knew that if once we began, we would not stop. There would not be enough left for thanksgiving. This dire threat was sufficient. Once tom came in and made a perfect three point landing in the roaster, we stuffed him, all taking turns as we packed him full of dressing both fore and aft. Only for one moment at the table, as we gazed beatifically at the repast before us, did the dressing look as magnificent as it tasted. Browned and crisp on the outside, steamy moist on the inside, perfect, it cascaded from the bird. Once the eating began however, and during its numerous incarnations as a leftover, it became again a greyish, brownish homely thing. But yummy. Always yummy. Presentation isn’t everything. It is the character of the dressing that counts. Gramma is gone now, but, she explained how to make it to her daughters, and she even wrote the recipe down a few times, but, like the dressing itself, each handwritten version of the recipe is different. When we make it every year, we do the same things. We save many kinds of bread, and we keep it in brown grocery bags with complicated diamond cut-outs. We still wonder why the bread must be stale, why the gravy must be canned. We call each other and say how much sage we used, so that we can express horror at the amount, or complain that there isn’t enough. But, each thanksgiving, no matter how much sage, or how little, the “grey stuff” as it has been affectionately dubbed, is emblematic of someone we loved, hearty, warm, rich and complex. Altogether delicious.